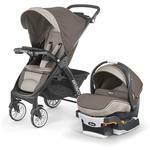 Provides comfort for parents with height-adjustable handle and linked rear brakes. Features one-hand fold, auto-positioning wheels and a self-standing compact fold. 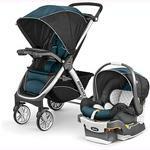 The Bravo® LE is a revolutionary 3-in-1 stroller that adapts to your changing needs as baby grows for use as an infant carrier using the KeyFit® or Fit2™ infant car seat, a Travel System, and a Toddler Stroller. 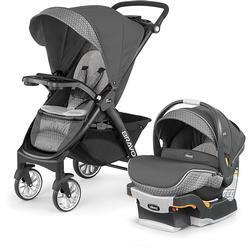 Sleek and sophisticated, the Bravo® LE Stroller in Coal is for the style-savvy parent who isn’t afraid to make a bold statement. Featuring a unique embossed knit with a classy dimpled pattern, Coal’s grey-on-grey fabrics create an elegant statement that never goes out of style. 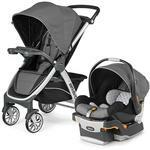 Multi-position reclining seat and all-wheel suspension for baby’s comfort. 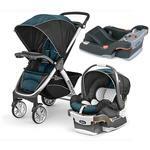 Infant Carrier: In its first mode for use with infants, Bravo® LE functions as a lightweight car seat carrier. It’s easy to remove the stroller seat and canopy, and click the KeyFit® or Fit2™ into the child’s tray car seat adapter. 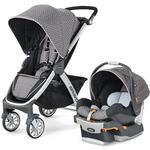 Travel System: During the transition time when baby rides in the KeyFit® or Fit2™ but also likes to sit up in the Bravo®, the KeyFit® and Fit2™ easily clicks in and out of the stroller seat. Toddler Stroller: When baby outgrows the infant car seat, Bravo® functions as a full-featured stroller for everyday travel with children up to 50 lbs. 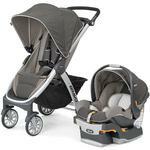 The Bravo® LE Stroller also features the smartest quick fold in its class! Simply lift up using the handle under the seat, and the front wheels automatically swivel into position for a compact, free-standing fold. With premium features like a removable, reversible seat insert, a child’s tray with cup holders, and extended canopy with flip-out visor, the Bravo® LE is designed for convenience.